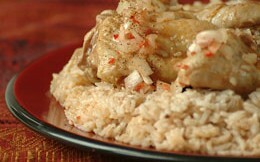 Lamb or chicken pelau is a Caribbean dish with carmelized dark-brown meat served over a bed of rice. Wash the rice three times, changing the water each time. Soak rice for a half hour to one hour. Heat oil in large pan or pot. Brown onion over medium heat. Add tomato paste, salt, pepper, coriander and garlic. Sautee for two minutes. Add water and simmer until tender—a half hour for chicken, an hour for lamb. While meat is simmering, boil water in a dutch oven or other large, lidded pot. Add rice, and boil for 4 to 5 minutes, until softened but still firm, like al dente pasta. Strain water from rice, and return rice to the pot. Add cardamom and garam masala. Make depression in center of rice and using slotted spoon add meat to the center of the rice. Cover meat with the rice that surrounds it, then cover rice with sauce. Using handle of wooden spoon or chopstick, poke 5 holes through the rice and meat mound to allow steam to escape. Cover pot. Put in oven at 450 degrees for 10 minutes. Reduce oven temperature to 350 degrees, and continue cooking for another 20 minutes. Serve on a large platter. Put the meat in the center of the dish and surround it with a ring of rice.